Hey! Council! Leave Them Trucks Alone! | Hapa...Shot the Food! Hey! Council! Leave Them Trucks Alone! HPT: Why don’t you think we have a vibrant street food culture in the U.S.? AB: There’s a huge hunger for it, there’s no doubt about that. I think some communities have embraced it and celebrated their more forward-thinking innovators. San Francisco has been cool, they’ve seen it as an instrument of social change by empowering immigrant communities. Portland, Oregon has embraced it, Austin, Texas, has a really interesting street food culture. Some places like New York have really resisted. They’ve fought it tooth and nail and see it as a threat to brick and mortar restaurants. It’s also a generational thing in a way. They don’t want hipsters lined up outside their doors. It’s the “get off my lawn” factor. Like or hate Tony Bourdain, and even if that second quote wasn’t his, I believe both quotes are correct. * Banning food trucks where there is less than 10 feet of unobstructed sidewalk. Ultimately, you block out a lot places for food trucks to congregate. Never mind that last bullet point is pretty darned vague. As a result, D.C. food trucks protested the proposed regulations at Farragut Square a few days ago by showing up but not opening their windows. The regulation hearing is slated to be on Friday. Glad to see some area restaurateurs, businesses, ANC Commissioners, and (holy cow!) Andrew Zimmern lending their support. Glad to know many of the public comments oppose these proposals. I’m also heartened to see support from the Washington Post Editorial Board and Greater Greater Washington. Health and safety regulations make sense, but to my knowledge the trucks already submit to inspections and have to maintain a basic level of safety in order to vend. Closing the sales tax loophole also made a lot of sense, and they have collected food sales tax for a while now. They do not block traffic at the two sites where I typically visit them. By the way, reaching a good variety of brick and mortar choices AND eating that food within a 30 minute limit is a bit of a stretch for one of those sites. Those of you who frequent trucks at other locations let me know if that’s not the case, though. These proposed zone regulations look to choke off a now vibrant part of D.C.’s food culture. Food trucks bring revenue to the city — and not just by charging sales tax! They give consumers choice, especially important in areas of the city that might not have a wealth of places to go to in a short amount of time like the second location I described. In my opinion, the zone regulations are a solution looking for a problem; it is revenue killing and food culture killing micromanagement. Yes, I live just outside the D.C. border and work in the city. I’m sure some of you reading this are probably ready to dismiss my opinion because my payroll and property taxes do not go to D.C. (I’m a renter, besides). I gladly visit the brick and mortars when I can, and I also do a bit of shopping in D.C. proper. I live close enough that I’m in Maryland one minute and walk into DC within 15. Some stores and restaurants are also convenient to work. I don’t grumble at the 10% food sales tax even though I grew up with a 4-6% one in S.C.; I know it’s been in place since I’ve visited here on school trips. 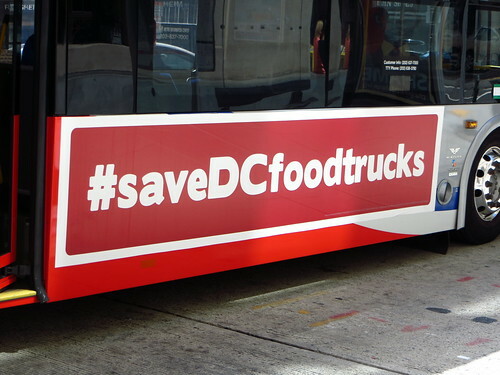 D.C. Council, I urge you to let the food truckers keep on trucking. I understand the need for sensible regulations. These zone proposals are far from sensible, though, and only serve to stop the city’s food trucks in their tracks. Arlington’s loosening their food truck regulations. You don’t want all that revenue going to Virginia, do you? Food truck photos: http://www.flickr.com/photos/sabine01/sets/72157625447596695/ . Posted on May 8, 2013, in Uncategorized and tagged food trucks. Bookmark the permalink. Leave a comment.